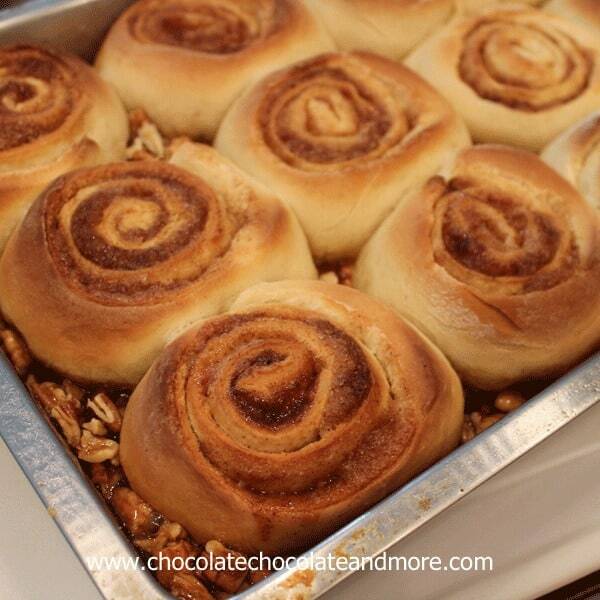 Caramel Pecan Sticky Buns - Chocolate Chocolate and More! 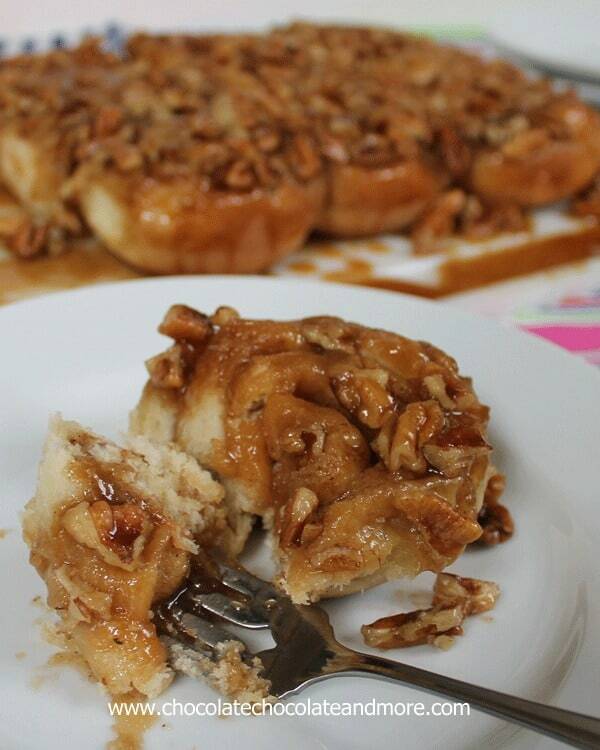 Caramel Pecan Sticky Buns, so easy to make and so good, you’ll want to make them every weekend! I should probably name these the lost rolls. I made these rolls almost 2 months ago. Just like I always do, I had a piece of paper and was writing down my measurements as I created, crossing out, making adjustments, spilling on my paper. Just a normal day in my kitchen. I always have that piece of paper right next to my mixer. It’s never a big deal. I usually Will transfer the recipe to the computer while my recipe is in the oven. But it didn’t happen this time. Someone slept over. I think it was one of Grace’s friends. I can’t even remember. But I didn’t get the recipe into the computer. And then I lost my piece of paper! I searched everywhere. On the counter, in the drawers. I even started shaking out cookbooks. That paper was gone. These rolls were good. I mean really good. Like burn your fingertips trying to get the last of the caramel out of the pan before it’s cooled, good. Like the caramel seeped into the twist of the rolls, making every bite a delicious, sugary, caramely bite. So this past weekend, my son stepped into the kitchen with me to recreate the magic. And we did. In fact, I think we made it even better the second time. In the bowl of your mixer, combine 1 cup flour, yeast, sugar and salt. Heat milk to 120 degrees and stir in butter, butter does not have to melt. Using the beater attachment of your mixer, stir in milk to flour mixture until well combined. Add in eggs, one at a time. Gradually add in remaining flour until a soft dough forms. Switch to dough hook or knead by hand for 7-8 minutes. Place dough in a lightly greased bowl, cover loosely with plastic wrap and let rise in a warm location until doubled in size. Prepare topping. In a small saucepan, combine butter, brown sugar and corn syrup. Heat until just below boiling and all sugar is melted. Pour into a greased 9 x 13 pan. Sprinkle chopped pecans evenly over topping. Set pan aside. Turn dough out onto a lightly floured surface and roll out into a 18 x 15 inch rectangle. Brush melted butter over entire surface. Combine sugar and cinnamon then sprinkle evenly over dough. Spread pecans in the same manner, coating evenly. Starting on a short side, roll dough, jelly roll style. Pinch seam to secure. Cut dough into 12 even slices approximately 1 1/4 inch thick. Place rolls, cut side down in prepared pan. Cover with plastic wrap and let rise until doubled and spaces between rolls are no longer visible. (at this point you can also place in the refrigerator for baking later) Once rolls are risen, remove plastic wrap and bake in a preheated 350 degree oven for 25-35 minutes, until golden brown. Remove from oven and let sit for one minute. Cover cooling rack or large tray with foil, then carefully invert rolls onto foil. PLease use caution. CARAMEL IS EXTREMELY HOT AND CAN BURN YOU. Remove pan and let rolls sit for 5 minutes before serving. Do you think I could make the dough in the bread machine? Lacey, I’m sure you could, just follow your machine’s instructions for dough only. 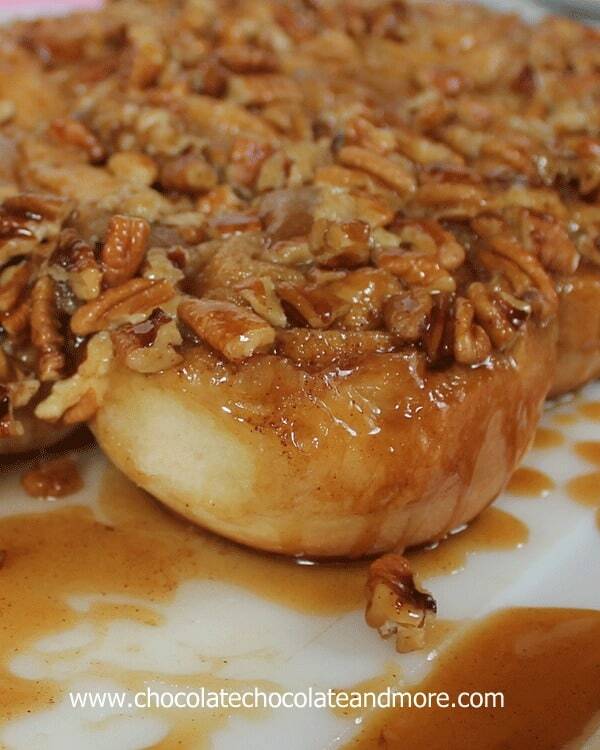 I am all about that gooey sticky caramel!!! Looks like the perfect breakfast to me!!! 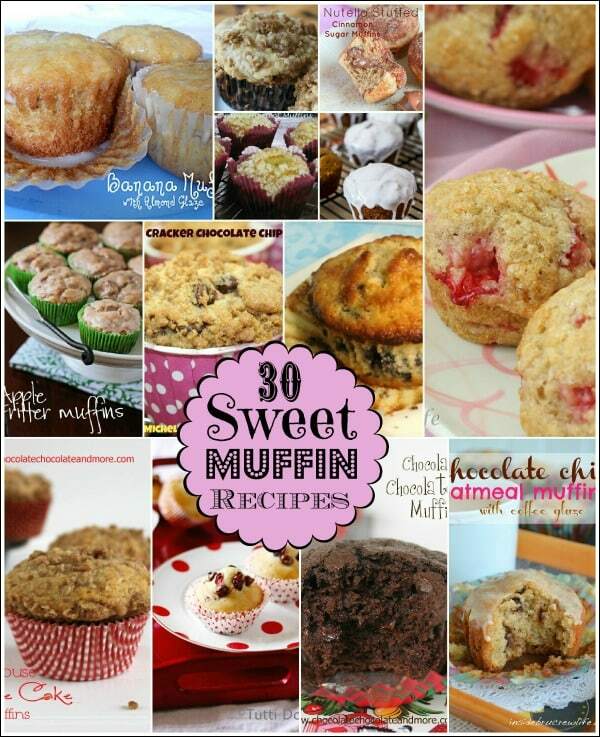 These look melt in your mouth delicious, yes, I’m hungry, unfortunately on a diet too. I’m giving a shower-brunch soon, and these are going to be there. I’m going to check out some of your other recipes. Thank you. Wow, these rolls look sooo good Joan. I can imagine waking up to the smell of these on the weekend, yum. These look freaking awesome! 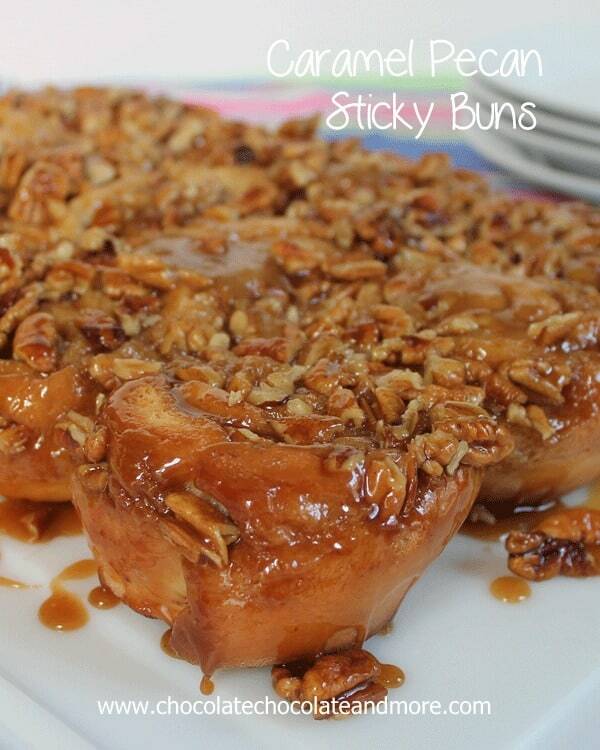 Sticky buns are the bomb and these look extra sticky! It’s great that you were able to replicate and even improve the recipe after losing it. Could I have a pan of these just for me? Thanks for linking up with What’s Cookin’ Wednesday! You are featured this week on Busy Monday at A Pinch of Joy! I hope you will stop by and grab a Featured Button from the Button Box on the sidebar. Pinned. Hi Kirsty, compared to most bread doughs, this one will be a little sticky but should still be manageable. If you you find it too hard to work with you can always add a little more flour. Glad you enjoyed them! Fun tip: to perfectly cut the cinnamon rolls, use floss! Slide it underneath roll and bring ends together! You will not be dissapointed! Thank you so much for this recipe! I searched through many, many recipes looking for the perfect one with the gooey goodness that I was wanting and I settled on this one. I have no regrets. It is perfect just the way it is written! These things are so good they are dangerous! Question number two! When I made these last time I followed the recipe aa written, and they were spectacular. Now I would like to make them again, but assemble them during the day and bake them the next morning. 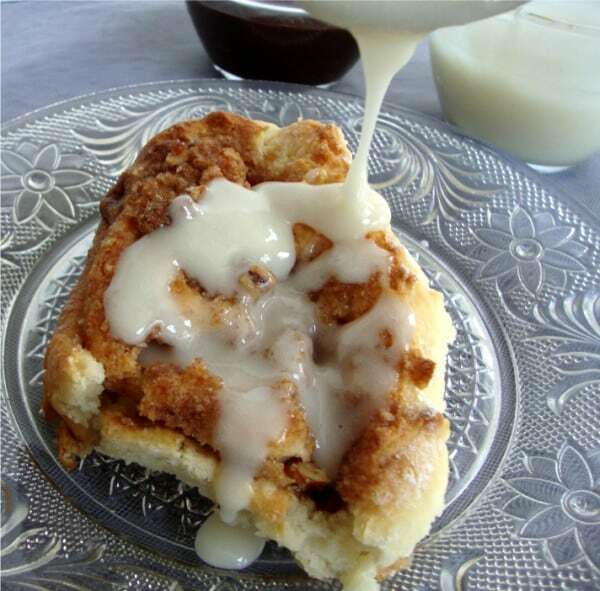 I have researched a few other recipes that do this, but I wanted to ask you since I have had inconsistent results when I do this with cinnamon rolls. Would you recommend I let them rise a little before putting them in the refrigerator or just let them rise assembled in the refrigerator? I could also take them out In the morning and let them rise some then. What do you recommend? So glad you enjoyed these. If you want to make them the night before, I’d prepare the rolls then place them in the fridge before any rising occurs. They will still rise in the refrigerator. In the morning, remove them from the fridge and let them come to room temperature before baking.